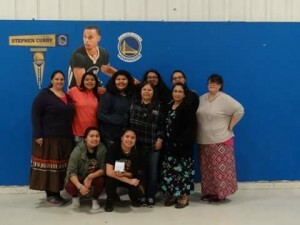 The Hanipa Tec’unpi Akic’ita (Hand game warriors) competed in the Sisseton Wahpeton Oyate Handgame tournament on April 15 in Agency Village. The Handgame Warriors defeated Flandreau in the first round, Tiospa Zina in the second round, Enemy Swim in the third round to go undefeated. They played Enemy Swim again in the championship to come out on top for a first place win. There were seven teams in the competition but the other three teams were beat out in early games.